Le Reve- The Dream, presented exclusively at Wynn Las Vegas, is currently seeking MALE and FEMALE DANCERS to join the current cast of performers. Technically-trained contemporary dancers. Men must be masculine and at least 6′ with a strong, athletic build. Must be proficient in adagio work. Women must be between 5’4” and 5’6” with a small frame, thin, athletic frame, able to execute adagio and acrobatic lifts. Men please wear body-conscious clothing that shows your build. No loose shirts or sweat pants. Ladies please bring heels and wear body-conscious clothing that shows your assets. 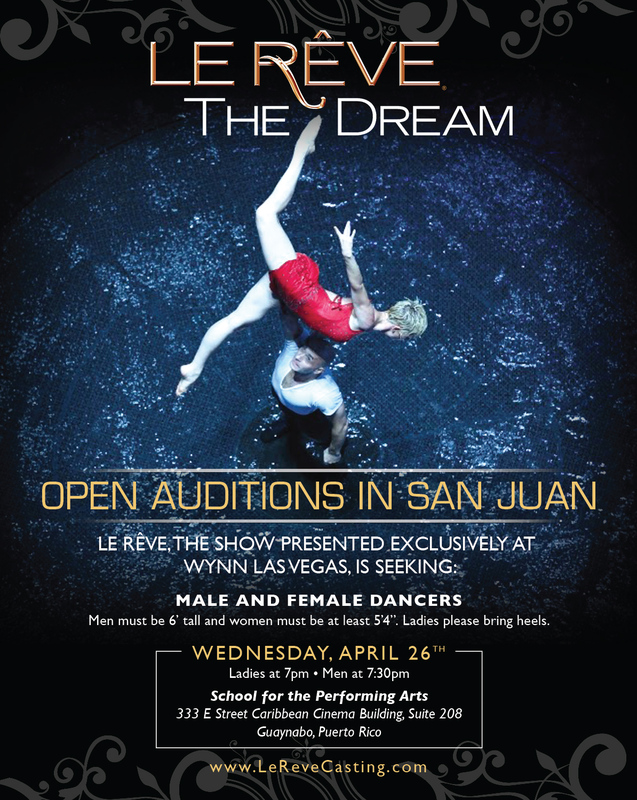 Le Reve is an aquatic show, so performers must be able to pass a swim test at the callbacks. For more information, please visit LeReveCasting.com.